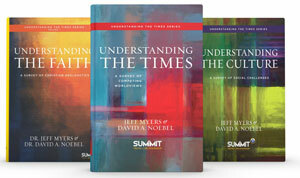 Understanding the Times is a classic invitation to the study of worldviews, a guided tour of the answers to life’s ultimate questions, now available for use in a digital curriculum format. Understanding the Times, examines the six most prominent worldviews influencing the world today (Christianity, Islam, Secularism, Marxism, New Spirituality, and Postmodernism), and it shows how their influence manifests in the key academic disciplines operating in America’s institutions of higher learning today (Theology, Philosophy, Ethics, Biology, Psychology, Sociology, Law, Politics, Economics and History). Designed as a one- or two-semester course, the SummitU app offers a digital, sequential, discussion-based series of three curricula which introduce compelling and helpful ways of thinking about the world. It will launch discussions about how ideas become persuasive and how to identify patterns of ideas so we can understand the world around us. If we help students master the world of ideas, they will be significantly less likely to be taken captive by false philosophies (Colossians 2:8) and significantly more likely to understand the times in which they live and know how to be responsible citizens (1 Chronicles 12:32). So join the hundreds of classrooms and families across the country (and around the globe!) equipping students to Understand the Times. What makes Understanding the Times such an outstanding resource is its succinct and clear outline of six worldviews and their ten disciplines, helpfully arranged in the worldview chart. We’ve designed a curriculum that will fill your screen — not your closet. The digital platform gives teacher and students access to the entire Understanding the Times curriculum: textbook, additional readings, videos, and an easily updatable syllabus that keeps everyone on the same schedule. The greatest strength and the greatest weakness of previous editions of the Understanding the Times curriculum has been the sheer scope of topics covered–attempting to bring forty-one topics (not to mention their sub-topics) to students in 18 or 36 weeks. While ambitious, the end result has been a curriculum that functions more as a crash course in everything rather than a careful introduction to key things. In the revision and digitalization of the Understanding the Times curriculum, we want to maximize the opportunity that a 36-week course can provide. We have developed a sequence of: focusing on the Christian worldview, on the collision of worldviews, and on the outworking of the Christian worldview. However, while the volumes in this series support one another, they are not dependent on each other. They can be reordered and used in whatever way best serves your students. In today’s media-saturated world, students most often lack meaningful engagement with ideas. We firmly believe that ideas take root when solid content is shared in the context of genuine relationships. We want to cultivate healthy relationships and provide meaningful content. So we have developed an array of course syllabi that assign 1-5 days of in-class discussion and interaction per week. We know that leading that much in-class interaction can seem be daunting, which is why we’ve teamed up with Wheatstone Ministries to provide practical training on educating through discussion. Their training videos available with every digital Teacher’s License.